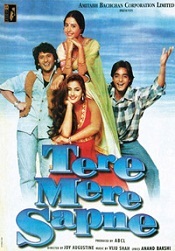 Tere Mere Sapne was directed by Joy Augustine and co-starred Chandrachur Singh, Priya Gill and Simran Bagga. Film tells the story of two young men born on same day, one in a rich family and another is in middle class family. Rich man wants to visit India against the wishes of his grandparents. While visiting India he becomes friend with a taxi driver who happens to the guy born on same day. They decide to exchange their places and they fall in love with two girls with their new identities. Rest of the story is about how they play their new roles ad get married. 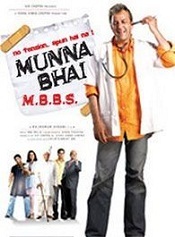 Munna Bhai M.B.B.S. was directed by Rajkumar Hirani and co-starred Sanjay Dutt, Jimmy Shergill, Sunil Dutt, Gracy Singh and Boman Irani. Film was made with budget of INR10 crore and earned INR30.75 crore at box office. Film tells the story of local gangster attending medical school as a challenge to become a doctor. He is helped by his friend called circuit who provides all the assistance he requires. In college he falls in love with a doctor who happens to be his childhood sweet heart. Story takes twist when he wants to quit medical because he thought it would be against his conscience to do it. Maine Pyaar Kyun Kiya? was directed by David Dhawan and co-starred Salman Khan, Sushmita Sen, Katrina Kaif and Sohail Khan. Film was a commercial success and earned INR55 Crores at box office. Film tells the story of young successful doctor struck between two girls. He tells his patient a lie that he is already married and has children but introduces his nurse as wife. With the help of his friend he arranges for fake divorce and marriage proceeding go on. But at last his patient convinces him to marry his nurse who is in true love with him. Salaam Namaste was directed by Siddharth Anand and co-starred Saif Ali Khan, Preity Zinta, Tania Zaetta and Jugal Hansraj. Film was made with budget of INR130 million and earned INR570 million at box office. Film tells the story of two young Indians living in Melbourne. Hero starts to work in a restaurant and heroine comes to Melbourne in one year foreign exchange program and decides to settle there working as radio jockey of ‘Salaam Namaste’. Rest of the story is how they meet, fall in love and troubled relationship. Golmaal: Fun Unlimited was directed by Rohit Shetty and co-starred Ajay Devgan, Sharman Joshi, Tusshar Kapoor, Paresh Rawal and Rimi Sen. Film was made with budget of INR110 million and earned INR699 million at box office. Film tells the story of four friends, one of them is a college student and other three uses his hostel for mischievous activities. Four of them find a bungalow of blind couple who were waiting for their grandson’s return to home, one of the four friends’ pretends to be their grandson and start to enjoy their time. Rest of the story is about the four friends protecting the blind from goons. 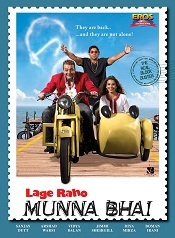 Lage Raho Munna Bhai was directed by Rajkumar Hirani and co-starred Sanjay Dutt, Vidya Balan, Boman Irani, Dilip Prabhavalkar and Dia Mirza. Film was made with budget of INR120 million and earned INR1.19 billion at box office. Film tells the story of protagonist who starts to see and hear from spirit of Mahatma Gandhi. To solve everyday problems he starts to use the suggestions of Mahatma Gandhi and solves everyone’s problem by adopting Gandhigiri also known as non-violence path. Rest of the story is how his enemies make him look like a person with psychological problems. 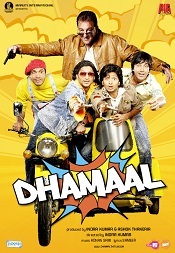 Dhamaal was directed by Indra Kumar and co-starred Ritesh Deshmukh, Javed Jaffrey, Sanjay Dutt and Aashish Chaudhary. Film was made with budget of INR300 million and earned INR887.5 million at box office. Film tells the story of four friends who are mad about making money and one day they meet a dying underworld don who tells them a hidden treasure of INR10 crores in Goa. Rest of the story is they running behind the treasure and cop chasing them. Golmaal Returns was directed by Rohit Shetty and co-starred Ajay Devgn, Kareena Kapoor, Shreyas Talpade, Tusshar Kapoor and Anjana Sukhani. Film was made with budget of INR240 million and earned INR1.8 billion at box office. Film tells the story of a man happily married and living with his wife and a mute brother-in-law. One night he saves a beautiful girl from goons and spends a night in a yacht of his friend. Protagonist with the fear of his suspicious wife he tells his wife that he spent a night with a fictitious friend named Anthony Gonsalves. Rest of the story is how he tries to avoid his wife’s suspicion. Golmaal 3 was directed by Rohit Shetty and co-starred Ajay Devgan, Mithun Chakraborty, Kareena Kapoor, Tusshar Kapoor and Shreyas Talpade. Film was made with budget of INR400 million and earned INR1.6 billion at box office. Film tells the story of rivalry between two families running water sports shack in Goa. Three robbers steal queen’s necklace and run from police to hide in Goa. To end the rivalry one head of the family goes to other family to find out that she is his college lover. They end up in marriage and rivalry stops between families but now they start to face the problems of robbers who hid the necklace in their house. 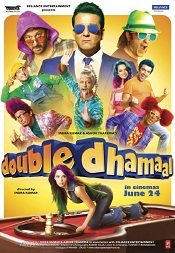 Double Dhamaal was directed by Indra Kumar and co-starred Sanjay Dutt, Mallika Sherawat and Riteish Deshmukh. Film was made with budget of INR350 million and earned INR680 million at box office. Film tells the story of four young men who are considered as useless by their parents, one day they see their enemy driving a luxurious car and they want to know the reason behind his money. They find out that their enemy is living off the wealth of his wife and they blackmail him to make them his business partners. Rest of the story is about they trying to rob a don and being in trouble. 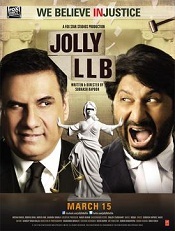 Jolly LLB was directed by Subhash Kapoor and co-starred Boman Irani, Amrita Rao and Saurabh Shukla. Film was made with budget of INR100 million and earned INR327 million at box office. Film tells the story of young advocate who tries to save the rights of 6 innocent wage earners. His journey against the rich monopoly and corruption in the system continues throughout the film. 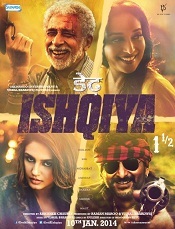 Dedh Ishqiya was directed by Abhishek Chaubey and co-starred Madhuri Dixit, Naseeruddin Shah and Huma Qureshi. Film was made with budget of INR15 crore and earned INR31 crore at box office. Film tells the story of uncle and his nephew stealing a necklace from a jewellery shop. There is a poetry contest where as per the condition of widow husband winner gets the widow as prize and gets the property as Nawab of Mahudabad. Both of them fall in love with two girls there and want to take part in the poetry contest. Queen selects local gangster as her suitor and story takes u turn when they come to know that queen is planning her own kidnap to save from bankruptcy.